I stood under the bold, bright lights of the marquee clutching my ticket. Dressed up and wishful, this was a night my imagination couldn’t have created on it’s own. Lots of familiar and famous faces lingered nearby, but all were equalized as fans, with the fervor of energy an undecipherable pitch. I don’t think anyone knew exactly what the night might hold, but one thing was for sure: we were all to share rare air with Zoso himself. The Theater at the Ace Hotel is a baroque dream; it features almost as many points as the conversation throughout the night. The warmth of the place was filled with cool people milling around with their arms wrapped around Page’s face, which was attached to a very hefty, quality photo book. The book was the reason we were there… sort of. The 512-page beast is the more consumer-friendly version at $42 than the special release a few years ago of higher quality and limited quantity. It is a photo-focused book spanning Page’s life and career, and his limited-engagement book tour and subsequent interviews have helped to provide some background and context the book lacks. The price of the book was factored into the ticket sales, turning the Theater at the Ace Hotel into a makeshift library. Once seated and able to examine the book, I was elated to find a Zoso stamp featuring the city and the date inside the cover. 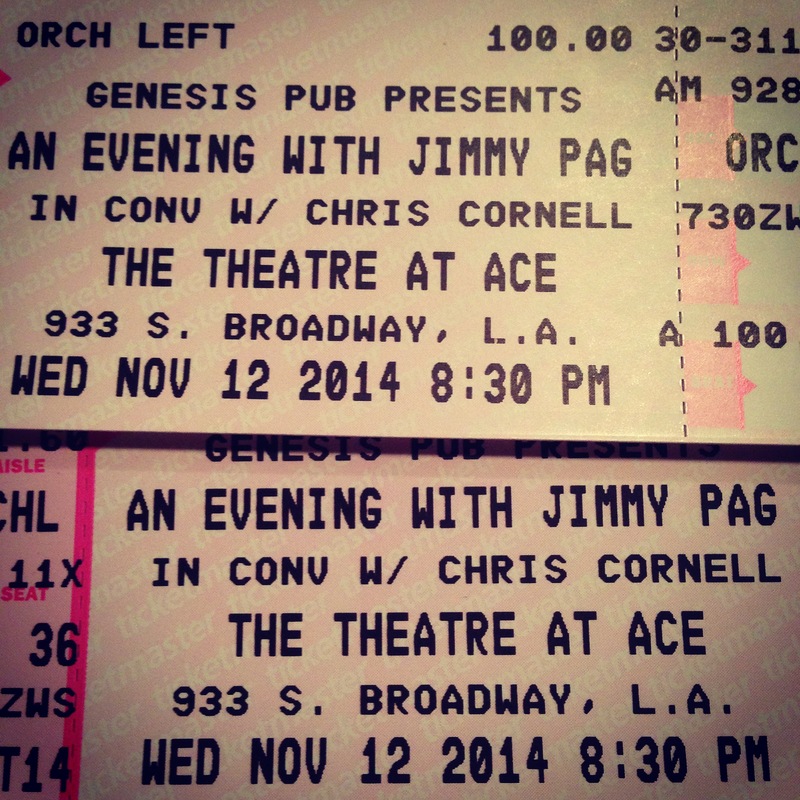 I lept from my seat as Chris Cornell and Jimmy Page emerged on the stage. I was surprised that the table they sat at for the “conversation” was at the far left side of the stage, but that was the side I was sitting on, so well done there. Cornell crossed his legs and focused on his laptop with reading glasses on, seemingly running the slide show that would be the driver of the conversation for the evening. Jimmy Page looked better than he has in years; comfortable, healthy, and at ease. Cornell’s white t-shirt and Page’s silver hair offered a break from the black of the rest of their sophisticated-yet-rocker-y attire. 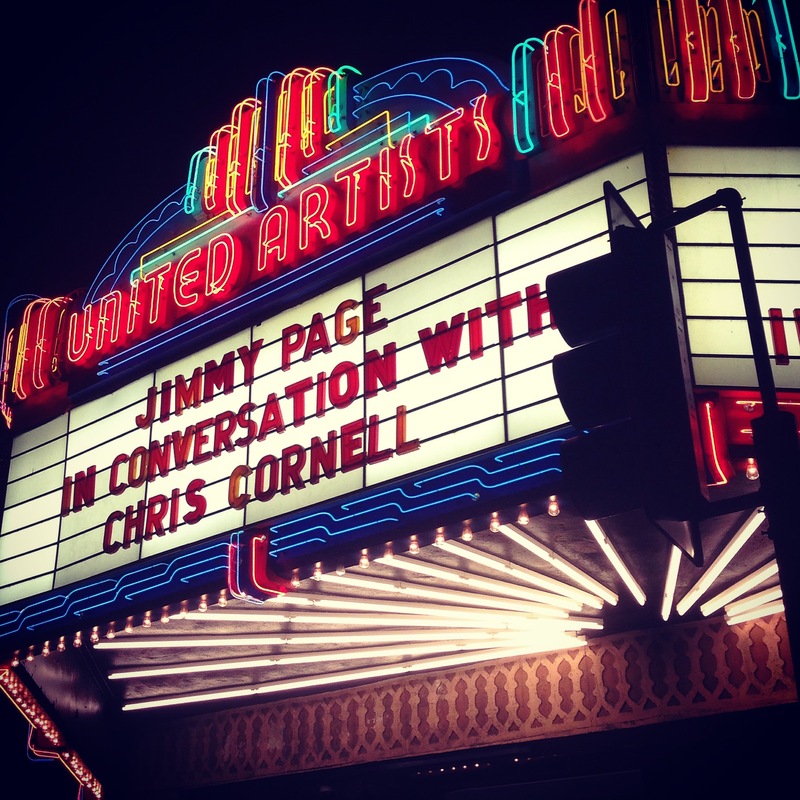 Page’s kind accent and demeanor coupled with Cornell’s relaxed ‘let’s grab coffee and catch up’ vibe kind of took me down a notch from foaming at the mouth to simply fanning myself; that said- these were stars and the crowd was up in arms. Now it was go-time. 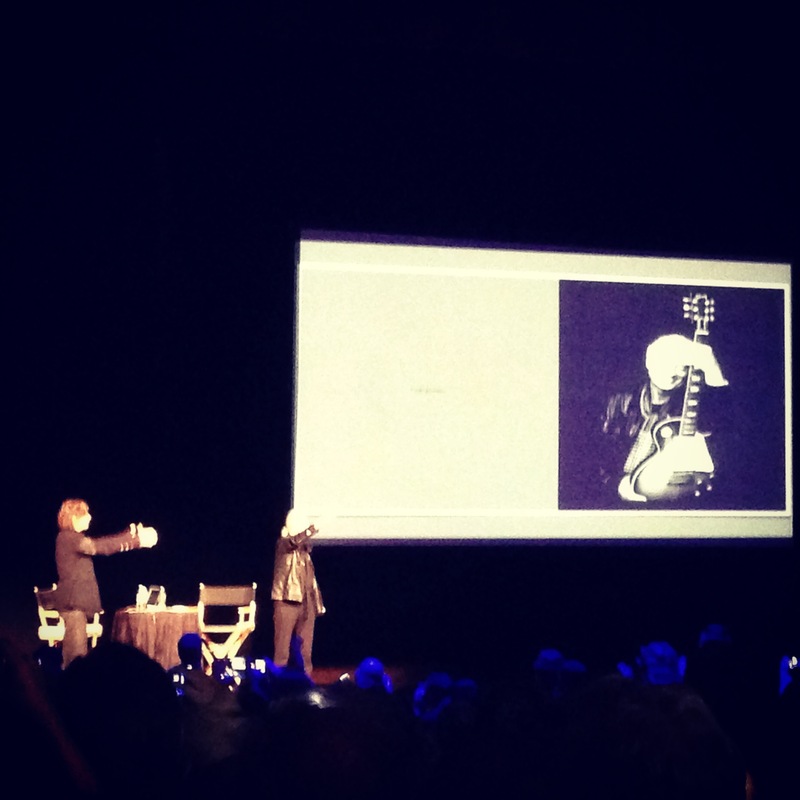 I have to say, even though it was Jimmy Page sitting there, my expectations were middled. He keeps things close to the vest. And what was Cornell doing there? One can only speculate. And on top of that, I have been to several of these things where- love the subject- but the mODDerator made things so incredibly awkward it rendered the experience… odd. I’m happy to report that this event exceeded expectations; the pairing just worked. The conversation flowed well, it was insightful, entertaining, and most important of all: authentic. I wouldn’t say the two could quite be compared musically, but it seemed as though having some commonalities made the conversation the best it could be. Rather than doing a book report on the book discussion- you can find those on the night elsewhere, such as places who famously panned Zeppelin albums- I took away some key things from the evening. First of all, as I would expect, Page came across as an extremely introspective person. In the way he would talk about the meaning of things in the photos, the preciousness of memories, the intentions of things; you can tell he must be like this from the music, but to sit there and watch him talk about things off the cuff for a couple of hours really brought this to light. 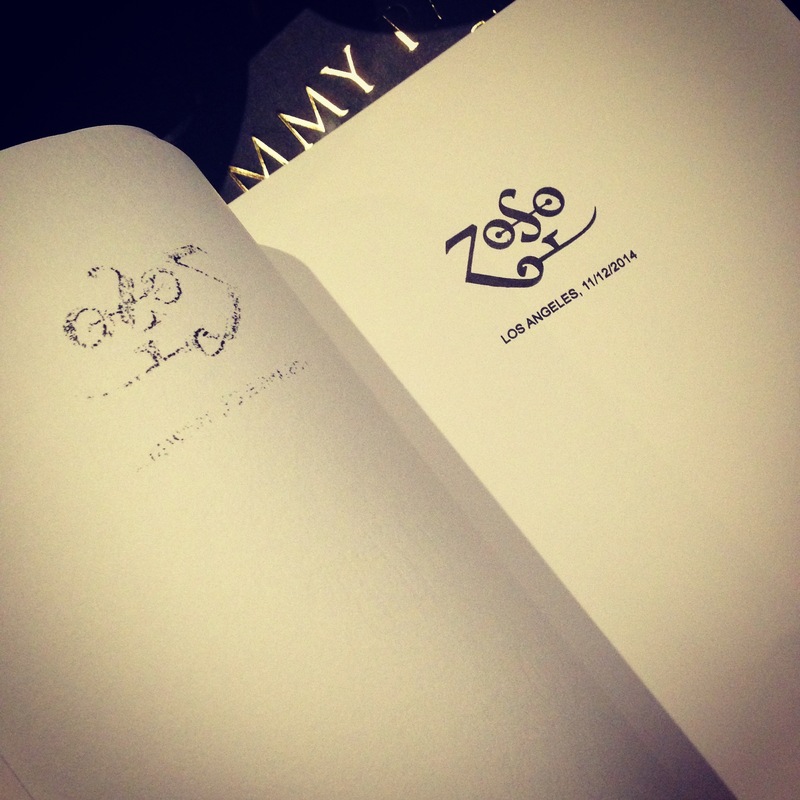 “The synchronicity was superb, really…”, he said when talking about Led Zeppelin I. That is the other key ingredient at play here, the unbelievable trajectory of events and relationships that made everything become what is now rock history. From the people in the frame, to the people taking the photos (Linda McCartney was revealed as one unexpected photographer), there was an overwhelming influx of talent in that era, and these pictures showed how they congregated together. It’s one thing to see family or friends talk about old photos with a glimmer in their eye; it’s another to watch a legend speak of legendary photos and describe the legend behind them. It was stated several times that Page was not informed beforehand which images Cornell had picked to discuss. Reactions seemed genuine; sometimes embarrassment, sometimes fondness, sometimes gloating. Another element that kept coming up was creative control. Funny thing: the only other time I was in this venue, I was there to see Lucifer Rising shown for the first time with Page’s soundtrack… but his lawyers stopped it from happening moments before the event, and we left early since we were pretty bummed out about this. Tonight was a good redeemer. That said, Page is a visionary; he creates things and protects them. This was evident across all he spoke of. Of course, fantasies had danced in my head of someone handing him a guitar and maybe Cornell would even sing a little. I mean, if you have a guitarist and a singer on a stage, it kinda seems like that should happen, right? Well that did not happen; but we were left with parting words of promises of Page in person again on a solo trek late next year. “It might get louder,” he said. Guess I’ll have to go. P.S. Bravo to the crowd, for being silent and then screaming at just the right parts, and for keeping their phones away during most of the night.